President George W. Bush spoke to a crowd of 1,200 at a promotional products trade show in Dallas Thursday hosted by the Advertising Specialty Institute. “History will ultimately judge whether I made the right decisions or not,” George W. Bush said about making on-the-spot decisions in the harrowing days after 9/11. President George W. Bush shared stories behind some of the most personal and defining moments of his presidency during a candid conversation on Thursday before a record-setting crowd of 1,200 at a promotional products trade show in Dallas hosted by the Advertising Specialty Institute. “History will ultimately judge whether I made the right decisions or not,” Bush said about making on-the-spot decisions in the harrowing days after 9/11. 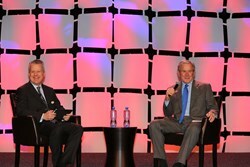 During the one-hour keynote, President Bush answered questions in an interview conducted by Timothy M. Andrews, president and CEO of the Advertising Specialty Institute (ASI; http://www.asicentral.com). The nation’s 43rd president touched on many subjects, including terrorism, crisis management, dealing with criticism, the economy, managing a business and his latest hobby, painting. The special presentation took place at the Kay Bailey Hutchison Convention Center on the final day of the promotional products industry’s largest event in the Southwest. The 67-year-old former Commander in Chief served two terms during the most tumultuous times in recent history, from 9/11 to the Iraq war and global financial crisis. President Bush and his wife Laura, who appeared at ASI’s Dallas show in 2011, live in Dallas, where they recently opened the George W. Bush Presidential Center. ASI’s three-day show attracted over 500 suppliers and 3,300 distributors from 43 states and seven countries. The 18 distributor sales meetings that took place included Staples Promotional Products. ASI is the largest media, marketing and education organization in the promotional products industry. ASI’s latest distributor sales report shows 2013 was the biggest sales year in the industry’s history, surpassing $20 billion for the first time. Promotional products, aka ad specialties, are items imprinted with a logo or slogan to market a company, non-profit organization, achievement or event, and are often given away free. For more info, contact PR Manager Dawn Marie at press(at)asicentral(dot)com. The Advertising Specialty Institute is the largest media, marketing and education organization serving the promotional products industry, with a network of over 25,000 distributors and suppliers throughout North America.